Build strength and tone back in your body after childbirth in a safe and effective way – find strength from the inside out. The beautiful Heather Restaurant will be the venue for our evening retreat. Class will run from 6pm to 7:30pm with a delicious healthy 2 course evening meal to follow, freshly prepared and made to order. 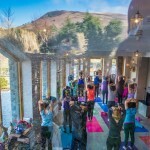 Navé Yoga Open Day Saturday 17th September – Free taster classes all day! New to Yoga? Come to our open day on Saturday 17th September to experience some free taster classes and introduce yourself to the ancient practice of yoga. All classes are suitable for beginners. Arm Balance and Inversions Workshop with Elaine and Adrian on Saturday 24th September 2-5pm. Join Elaine and Adrian on this journey into arm balances and inversions to fine tune your postures. Learn how to use breath and bandhas to become stronger and lighter in your arm balances and inversions.